I don't think anybody should have been surprised by Paramore's career trajectory - and that anybody who knows my style of reviews should not really be surprised why I completely passed them by in 2013. See, Paramore started off in the mid-2000s as a band loosely affiliated with emo with the harsher guitars, but it was a band that had its eyes fixed on one particular bandwagon: that of the pop starlets with attitude in the vein of Pink or Avril Lavigne or Kelly Clarkson. And considering this was a subgenre I liked in the decidedly uncertain pop landscape of the mid-2000s, when I was a teenager, you'd think I would have jumped on the Paramore bandwagon... but no, every single I heard from the band never really impressed me. That first album All We Know Is Falling was decent enough for its teenage angst and decent and Hayley Williams was a born star behind the microphone, but the songwriting did nothing for me whatsoever, lacking the colour and description and rawness that always gave Pink or Avril Lavignre distinctive presence. And coupled with some bare-bones melody lines and not stellar production, I could not have been less interested in Paramore. Then came the second record Riot!, which was better and had 'Misery Business', 'crushcrushcrush', and 'Fences', three songs that actually had some interesting melodies and some better articulated subject matter. But for the most part most of the album fell into the grey zone of pop rock for me, lacking the edginess or punch of rock or the gripping hooks of pop to really stick with me, and while the songwriting had gotten better, I couldn't help but feel that the production was holding this album back from being truly great - just a little too flat and lacking in melodic focus to really stick with me. And with the slow collapse of the pop rock boom and rumors of instabilities within the band, I didn't expect to see another record. But in 2009 they apparently resolved enough of their differences to release Brand New Eyes, which was okay and did show a bit of improvement in the songwriting, but it wasn't as catchy or interesting as Riot! and it was this album that brought 'The Only Exception', which for me sealed Paramore's new pop direction after pop rock dropped off the mainstream radar. And with that shift came a change in lineup, as the brothers Josh and Zac Farro both left the band in 2011 for reasons that spanned creative differences, accusations that Hayley Williams was being trumped up as the star over the rest of the band, and even conflicts in relligion and the band's content. Either way, it was an entirely different act that released Paramore's self-titled album last year, one of their biggest and most successful to date. So now, you're all looking for me to answer the big question: is it any good? It's... good, I guess. And honestly, I'm a little startled that of all of the albums released last year, it's this one you guys wanted me to cover. I mean, it's not a bad record by any stretch, and there were definitely far worse albums that came out last year, but as it is, it's a pop rock record that didn't strike me as all that exceptional across the board. And I really don't get the critical acclaim that caused so many critics to lose their heads and throw around a lot of hyperbole in reference to this band. Sure, it's good and I wouldn't say there are any real duds on this record, but I wouldn't call it exceptional and I wouldn't call Paramore 'one of the finest rock bands in America'. That said, I get why people love this band and for what Paramore is trying to deliver, it mostly works. So why doesn't this record click for me in the same way it works for so many others? Well, we should start by addressing the noted shift in direction instrumentally between this record, which is defiantly more pop-friendly and lighter than their emo-inspired roots. This is mostly courtesy of Justin Mendel-Johnsen, most notable for his work with M83 and the Neon Trees but also known by me for production work on the last album from Young The Giant - and while the production is nowhere near as cacophonous and messy as it was on that record, I'm still forced to ask the question what the addition of the gurgling synths and fuzz really bring to this record other than a sense of power pop quirkiness. A lot of it comes across as just additional bells and whistles without really contributing to the melody or the hooks. Now occasionally, they contribute well like on 'Ain't It Fun' with, with the bouncy synth line and the choral vocals, but it never feels properly balanced to really match Hayley Williams on the chorus. Now that's not saying all the experimental flourishes are bad: I thought the synth balanced against the pluckier guitars on 'Last Hope' was well done, I dug the Spanish guitar transition on '(One of Those) Crazy Girls', and I thought the stormy post-punk inspired guitar line on 'Part II' easily made it my favourite song of the record. But for the most part, the twinkling pianos and bubbly electronics and especially those ukulele interludes strike me as gunning for a very twee sound, and it doesn't always strike me as cohesive with the downtuned guitars gunning for a bit of heavy snarl. Actually, if we're looking for a component of the instrumentation that irked me most, it'd probably be in the guitar tuning and tone, which would be absolutely fine if the band was going for some rougher, fast-paced riffs, but the choice to gun for more melodic pop music means that the downtuning and heavier fuzz doesn't exactly accentuate the melodic progressions, which leaves several songs lacking a firm foundation for me. And what's worse is that you can tell the rough edges are pushed back a little further in the mix behind the synths and drums, and considering the guitars are often carrying the melodies, that can get exasperating. But I get what they were trying to do - Paramore was looking to move towards pop and yet preserve a little of their characteristic heaviness. And I'll give Hayley Williams credit in that she's a versatile enough performer to back that dichotomy up. Do I prefer her harsher, more mature sounding rock vocals? Absolutely, but I'll admit she's capable at the more cutesy material. I do wish the vocal production had exposed a little bit more of an edge in her voice, shown a little more rawness, but if they were going for a modern pop sound, I get why it's toned back. But that being said, it's one of the factors to one of my big issues with this record, in that the first third is incredibly obnoxious. Now some of you are saying, 'Wait, Mark, you like Kesha and early Avril Lavigne, this sort of bratty obnoxiousness should be right up your alley', but there's a key difference: that obnoxiousness was brash and in your face and at its best had nuance and depth and never pretended to be anything it wasn't. Paramore's brand of obnoxiousness, however, is more subtle and a lot less tolerable to me, which takes us to lyrics and themes. And I'll be the first to say that on a technical level, the songwriting is stronger than ever in terms of lyrical flow and poetry - but all the improvements here don't excuse the fact that the first third of this album is a kiss-off to ex-bandmates Josh and Zac Farro that really don't ring as having a lot of taste, especially when there's a smugness to the bratty lyrics that really hits a sour point for me. 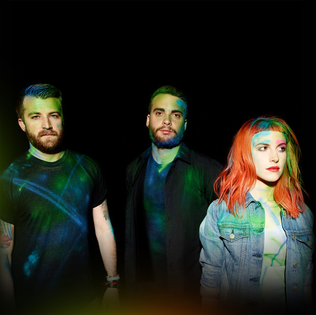 If we were looking for a low point of this record, it'd be right in the beginning with 'Now', featuring a stuttered chorus that gets incredibly annoying, and 'Grow Up', a kiss-off track where Hayley Williams tries to flaunt her newfound maturity and completely misses the point that this record has some of the most simplistic and juvenile songs and presentation yet. Hell, the next two songs are a hyper-earnest yearning track and an interlude where she sings about moving on from all those negative people - uh, who are you trying to convince, Hayley, me or yourself? And by the time we got to the veiled sarcasm of 'Ain't It Fun', I was just about done with Paramore's smugness masked behind flowery instrumentation - it wasn't populist, it was self-absorbed and painted a very unflattering picture. Thankfully, that's when we got 'Part II' and 'Last Hope', which might skirt melodrama a bit but at least showed vulnerability and a degree of maturity. It's also where this record settles into more of a narrative arc, as it loosely sketches out a relationship that breaks apart and Hayley Williams getting over it to move on with her life - you know, actual maturity. In fact, if we're going by the last two thirds of this album, I'd totally get the critical acclaim, because there's actually some solid nuance here in between the middle finger to haters on 'Anklebiters' and the real empathy of 'Hate To See Your Heart Break'. For instance, while '(One Of Those) Crazy Girls' doesn't exactly innovate when it comes to this sort of material, but it works for what it is. Now I wouldn't call any of this stellar - the songwriting lacks a little character and description to really grip me or ground the scenes, but I definitely get the appeal and it does speak to a more universal audience by not setting details. And it's here where we get the most mileage out of Williams' songwriting, because the final two tracks 'Be Alone' and 'Future' show that desire to just be on your own to sort your feelings out, and I love that 'Future' ends with a good four minutes of dark, noise rock-inspired riffing and haze with a thick ominous bass line, showing just how intimidating that next step can be. So in the end, I guess I mostly liked Paramore's self-titled record, but more importantly, I understand it, and I understand why people like it. I get the appeal of rougher production yet just enough of a pop edge to draw people in, and I get the appeal of songwriting that might lack a little description and yet still have a certain universality behind it to which many people can relate. And while Hayley Williams might be pretty far down the totem pole of 'rock girls' I like or can take all that seriously, she's a versatile enough performer to anchor the album, and her songwriting is only getting better. There are production and songwriting issues that prevent me from ever embracing it - and as I said, the first third of this album is really hard for me to get through - but as a whole, the record mostly works and it does clear enough of the way for Paramore going forward. So in the end, it's a 6/10 for me, but definitely a recommendation if you're into this sort of material. As for me, I see good things for Paramore to come, so let's see what happens with that next album: they've got an interesting future ahead of them. Why don't you review Blackout by Britney Spears? That album inspired many of the pop songs that is on the radio today. FYI, "Ain't it Fun" isn't about the Farro brothers' leaving the band; it's about Williams mocking herself for moping after moving from Nashville to L.A.